I’ve got a classic Ted Nugent pick from his Damn Yankees days. There’s a nice but short book out on the history of guitar picks, called ‘Picks!’, by Will Hoover. It comes – nice touch – with it’s own pick, and also has a chapter on collectors. i started collecting picks about 2 years ago.its an addictive hobby. 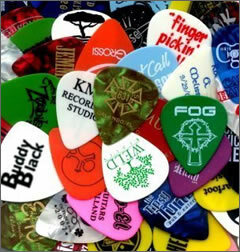 mostly aerosmith picks in my collection few acdc,the who,stray cats,guns n roses. ive seen some picks sell for Â£300. So what pick does Angus favour? A white Fender medium gauge..or at least he did in 1982! That’s me – looking at the floor rather than the stage because I’m obsessed with collecting guitar picks and catching them at shows. If you wait til the show is over, there won’t be any guitar picks left on the ground to find…unless it’s a Cheap Trick show, where there are literally 100s of picks. I’ve collected LP’s for over 35 years & picks for 25+. All the picks I have, I have either got my bumps & bruises getting them or the ones I have bought have certificates of authenticity. I don”t just take COA lightly. A good example would be Craig Hopkins with his collection of not only picks, but lots of other rare items from the late GREAT Stevie Ray Vaughan. I also am the type that wants a pick that has been used to make music. Cheap Trick throws them in the crowd by the hand full. Last pick I got from Warren Haynes, he had used for over 45 minutes. That’s the one I want. In between songs he started rubbing the edges & I knew he was about to toss it. He did & I was right there. Also know ahead of time what side of the stage YOUR MAN or WOMAN is going to be singing, since the picks are sometimes stuck to the mic stand, I feel that is the best place for a score. Be cautious what you buy & always carry a couple of bandades in your pocket to get to your treasures. Good Luck. hi does any one want trade some picks or drumsticks from bands? ?